Posts | smallgroupfitclub | Personal Training that everyone can afford! Personal Training that everyone can afford! Here are the 20 most weight loss friendly foods on earth, that are supported by science. New studies show that they don’t adversely affect blood cholesterol and don’t cause heart attacks (1, 2). One study of 30 overweight women showed that eating eggs for breakfast, instead of bagels, increased satiety and made them eat less for the next 36 hours (3). Another 8 week study found that eggs for breakfast increased weight loss on a calorie restricted diet compared to bagels (4). Eggs are also incredibly nutrient dense and can help you get all the nutrients you need on a calorie restricted diet. Almost all the nutrients are found in the yolks so just throw that tasteless egg white option out the window!. Eating leafy greens is a great way to increase the volume of your meals, without increasing the calories. Numerous studies show that meals and diets with a low energy density make people eat fewer calories overall (5). Leafy greens are also incredibly nutritious and very high in all sorts of vitamins, minerals and antioxidants. This includes calcium, which has been shown to aid fat burning in some studies (6). This nutrient is necessary for proper function of the thyroid, which is important to keep the metabolism running optimally (7). Studies show that a huge number of people in the world aren’t getting all the iodine they need (8). Salmon is also loaded with Omega-3 fatty acids, which have been shown to help reduce inflammation, which is known to play a major role in obesity and metabolic disease (9, 10). They are also highly nutritious, and contain cancer fighting substances (11). Although processed meat is unhealthy, studies show that unprocessed red meat does NOT raise the risk of heart disease or diabetes (12, 13). According to two big review studies, red meat has only a very weak correlation with cancer in men, and no correlation at all in women (14, 15). Protein is the most fulfilling nutrient, by far, and eating a high protein diet can make you burn up to 80 to 100 more calories per day (16, 17, 18). If you’re on a low carb diet, then feel free to eat fatty meats. But if you’re on a moderate- to high carbohydrate diet, then choosing lean meats may be more appropriate. White potatoes seem to have fallen out of favor for some reason. On a scale called the Satiety Index, that measures how fulfilling different foods are, white, boiled potatoes scored the highest of all the foods tested (21). If you boil the potatoes, then allow them to cool for a while, then they will form large amounts of resistant starch, a fiber-like substance that has been shown to have all sorts of health benefits… including weight loss (22). Dairy products are also high in calcium, which has been shown to aid in the fat burning process (25). Despite being mostly fat, they also contain a lot of water, so they aren’t as energy dense as you may think. Avocados are perfect as additions to salad, because studies show that the fats in them can increase the nutrient uptake from the vegetables 2.6 to 15-fold (25). Several studies in humans suggest that vinegar can be useful for people who are trying to lose weight. Taking vinegar at the same time as a high-carb meal can increase feelings of fullness and make people eat 200-275 fewer calories for the rest of the day (26, 27). One study in obese individuals also showed that 15 or 30 mL of vinegar per day for 12 weeks caused weight loss of 2.6-3.7 pounds, or 1.2-1.7 kilograms (28). Vinegar has also been shown to reduce blood sugar spikes after meals, which may lead to all sorts of beneficial effects on health in the long term (29, 30). They’re an excellent snack, containing balanced amounts of protein, fiber and healthy fats. Studies have shown that eating nuts can improve metabolic health and even cause weight loss (31, 32). Population studies have also shown that people who eat nuts tend to be healthier, and leaner, than the people who don’t (33). This includes some non-gluten, whole grains that are loaded with fiber and contain a decent amount of protein as well. Oats are loaded with beta-glucans, soluble fibers that have been shown to increase satiety and improve metabolic health (34, 35). Rice, both brown and white, can also contain significant amounts of resistant starch, especially if cooked and then allowed to cool afterwards (36). Keep in mind that refined grains are a disaster, and sometimes foods that have “whole grains” on the label are highly processed junk foods that are both harmful and fattening. If you’re on a very low-carb diet then you’ll want to avoid grains, because they are high in carbohydrates. But there’s nothing wrong with eating some of the healthier grains if you can tolerate them and are not on a low-carb diet. They contain a substance called capsaicin, which has been shown to help reduce appetite and increase fat burning in some studies (37, 38, 39). One study showed that eating 1 gram of red chili pepper reduced appetite and increased fat burning in people who didn’t regularly eat peppers (40). Numerous population studies have shown that people who eat the most fruit (and vegetables) tend to be healthier than people who don’t (41, 42). Of course… correlation does not equal causation, so those studies don’t prove anything, but fruit do have properties that make them weight loss friendly. In a study of 91 obese individuals, eating half a fresh grapefruit before meals caused weight loss of 3.5 pounds (1.6 kg) over a period of 12 weeks (43). So… eating half a grapefruit about a half hour before some of your daily meals may help you feel more satiated and eat fewer overall calories. This makes chia seeds a low-carb friendly food, and one of the best sources of fiber in the world (44). Because of all the fiber, chia seeds can absorb up to 11-12 times their weight in water, turning gel-like and expanding in your stomach (45). Although some studies have shown that chia seeds can help reduce appetite, they have not found a statistically significant effect on weight loss (46, 47). These fatty acids have been shown to boost satiety compared to other fats, as well as increase the amount of calories burned (48, 49). There are also two studies, one in women and the other in men, showing that coconut oil led to reduced amounts of belly fat (50, 51). Of course… coconut oil still contains calories, so adding it on top of what you’re already eating is a bad idea. Another excellent dairy food is yoghurt. Yoghurt contains probiotic bacteria that can improve the function of your gut. Just make sure to choose plain full-fat yoghurt… studies show that full-fat dairy, but not low-fat, is associated with a reduced risk of obesity and type 2 diabetes over time (52). Flavored Low-fat yoghurt is usually loaded with sugar, so it is best to avoid that stuff like the plague. Remember when they remove fat form foods they usually replace it with sugar-yikes! Studies show that Sugar is more addictive than Cocaine and Heroin! This is pretty startling an upsetting…right? How can something we all LOVE to eat be more addictive than some very serious drugs? Is anyone doing anything about this? What are WE going to do about it? James DiNicolantonio is a cardiovascular research scientist at St. Luke’s Mid-America Heart Institute in Kansas City, Mo. He recently published a comprehensive review of dozens of studies in which he contends that sugar is more dangerous than salt when it comes to risk for heart disease. He says that refined sugar is similar to cocaine — a white crystal extracted from sugar cane rather than coca leaves — and that studies show it can be even more addictive than the recreational drug. DiNicolantonio believes that the FDA could help to lessen the issue. “The government subsidizes corn, so high fructose corn syrup is cheaper than sugar, and that’s why it’s so ubiquitous in our diets,” DiNicolantonio explained. “They need to start subsidizing healthy foods. Ok so the good news is that you can still have sugar occasionally….. key word-OCCAISONALLY! The big message here is awareness. Read your labels… don’t eat things with added sugar that should not have added sugar or any of it’s forms. According to Dr. Nicole Avena of the Icahn School of Medicine at Mount Sinai, “pizza is the most addictive food because of the hidden sugar you’ll find in just once slice. From the tomato sauce to the dough, there’s a whole lot of sugar in a single slice — more so than a handful of Oreos.” Yikes, pizza??? This is where we all need to take a greater interest in what we actually are eating compared to what we thought were eating. Of course, eating at home is always a great solution to knowing what is in your food. Fruit should taste sweet to you, OK.. ripe fruit should taste sweet to you! If it does not, try detoxing from sugar AND artificial sweeteners to reset your palette and insulin resistance level. The Ugly Truth About Soda! OK so I just got back from Mexico for a lovely week or relaxation, sun surf and buffets. I am left with the burning question: Why do so many people STILL drink soda? I guess there are STILL a lot of popoholics out there. It’s cold, refreshing, and fizzy. It quenches your thirst, has 23 flavors, is timeless americana, and who doesn’t LOVE to do the DEW?! What’s not to love?! Turns out… a lot of things…..and some of them can KILL you!! What does that even mean? Empty calories refers to calories consumed, but with no nutritional gain. When we eat nutrients: protein, carbohydrates, health fats, our body breaks them down and uses them as fuel. Doesn’t happen with empty calories. We put calories in, but get nothing out. No nutritional value. Got it? Good. Water, milk, tea. Need I say more? Studies have found links between consuming sugary tasting (even if artificially sweetened) drinks might be leading you to a higher desire for sweetness overall. So you crave other sugary gunk after drinking fake sugary diet pop. What is in pop after all? A lot of things you can’t even pronounce right? Phosphoric Acid: Can interfere with the body’s ability to use calcium, which can lead to osteoporosis (softening of teeth & bones) Phosphoric acid also neutralizes the hydrochloric acid that naturally occurs in your stomach, which can interfere with digestion, making it difficult to utilize nutrients-yikes!! Sugar: Soda manufacturers are the largest single user of refined sugar in the United States. It has been proven that sugar increases insulin levels, which can lead to diabetes, heart disease, high blood pressure, high cholesterol, weight gain, premature aging and many more negative side effects. 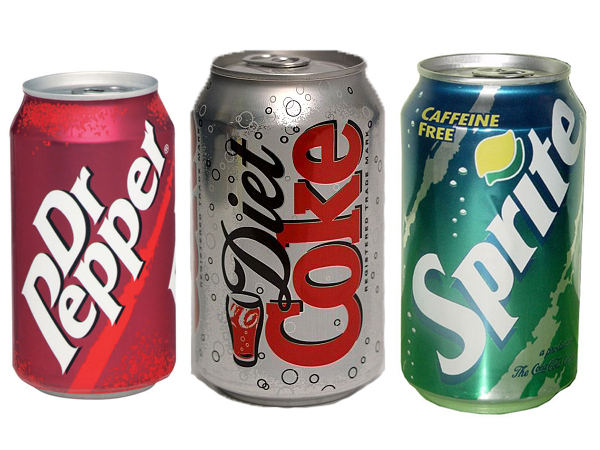 Most sodas include over 100 percent of the RDA (recommended daily allowance) of sugar!! AH! Just in pop alone, think about how much sugar you’re consuming including the rest of your diet or if you consume a couple pops a day! Double yikes!! Caffeine: Caffeinated drinks cause jitters, insomnia, high blood pressure, irregular heartbeat, elevated blood cholesterol levels, vitamin and mineral depletion, breast lumps, birth defects, and perhaps some forms of cancer. Caffeine also dehydrates you. It takes more water to process the caffeine in pop than there is water already in pop, so water in the body is used to process the caffeine. Not such a thirst quencher after all. Dehydrator. Not to mention that it can also act as a diuretic, making you pee more! Makes you want to drink more…. hmmm. Good way to sell more sodas! So really the bottom line is, pop is not what we need to be drinking. Pop is not something we NEED at all really. So if you’re a popoholic, try to cut back. Try water. Try tea. Try club soda with embellishments. If you can’t face life without soda remember you don’t have to cut it out completely, but save it for a special treat, not an every day drink. -Salmon on the Grill-easier than you think! It’s Wild and fresh Copper River Salmon season here….yum! Lot’s of folks are intimidated by cooking fish on the grill. Here is the super easy low down how to season and cook your own super healthy and delicious whallop of Omega 3 healthy Salmon. Did I say yummm? -Fresh and wild Salmon Filets–previously frozen doesn’t taste as good and farmed is not only bad for the environment but is fed gmo soy and corn meal, dumped with antibiotics and fertilizers and then colored with toxic chemicals-yikes! so stick to wild if at all possible!! A-Check for bones and remove with needle nose pliers-just grab and pull. Don’t worry if you tear the fish a bit, it will be fine. It is much more enjoyable to do this part before cooking. The bones usually are in a row so just use your fingers to feel for them. Trim off any large fatty or discolored areas. Gently rinse filets with water and pat dry with paper towel. Sprinkle Salmon liberally with rub and let sit at room temp for a 5-10 min before grilling. Store extra rub in an empty spice jar or sealed baggie for next time! Marinate Salmon filets face down in marinade for 15 min to 12 hrs before grilling. C-Preheat your grill on high for 5 minutes. Clean grate and turn down to med/low. Place salmon filets skin side down on the grill grate and close the lid. Grill for 8-12 minutes for medium depending on the thickness of your fillets. Remove from grill. You can remove the skin before serving by sliding the spatula between the skin and the meat-the skin should slide right off. I also like to gently scrape off the brownish gray layer between the skin and meat. You can also serve your filets with the skin on. It is easy to remove bites of meat from the skin with a fork. Serve over a bed of greens with light balsamic dressing or with steamed veggies and whole grain rice. YUM! I don’t even like celery but, I LOOOOOVE this salad! AND Celery is a great source of Calcium, Fiber, Potassium, Vitamin A, Vitamin B6 and Vitamin C-which is COOL! Did I say mmmmmmmm? -Add dressing to moisten well. Cover add refrigerate for at least ah hour to allow the celery to crisp and the flavors to develop. 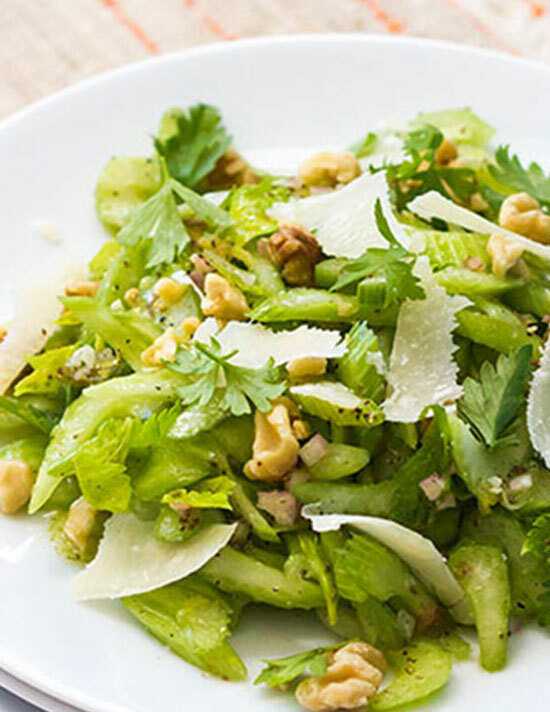 – When ready to serve, arrange the celery on a plate or bowl, shave the parmesan onto the celery with a vegetable peeler or paring knife, then sprinkle with walnuts and serve immediately. Colorful berries. 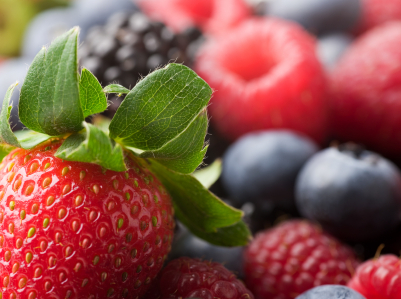 The antioxidant anthocyanin is what gives berries their blue, red, and purple colors. To get a healthy dose of this potent antioxidant, eat plenty of blueberries, raspberries, strawberries, blackberries, pomegranate, cherries, acai berries, and blood oranges, to name a few of the best choices. Each of these foods has a variety of other powerful antioxidants that repair and protect your skin’s cells. Dark chocolate-This is rich in supernutrients epicatechin and catechin. When experts gave women a cocoa drink extra-rich in these things for three months their skin quality improved, showing better hydration and reduced roughness and scaling. Red peppers & Spinach. -In Italy, researchers have shown that having 10mg of the yellow pigment lutein, which is found naturally in red peppers, can improve our skin’s elasticity. In theory, this makes it less prone to fine lines and wrinkles by giving additional antioxidant capacity to your skin and enhancing skin hydration. Aiming to have one lutein-rich food a day may help to slow down skin aging. 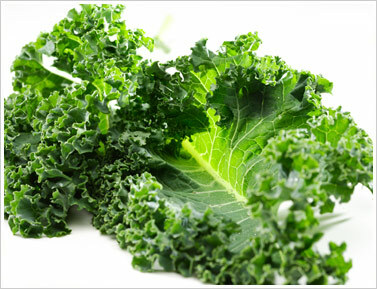 Kale– Just one 80g portion of kale gives 17mg of lutein! Some find it hard to enjoy eating kale. Try this recipe for Baked Kale Chips, it’s a real winner-even with the kids! Tomatoes- These are bursting with their own special red pigment, lycopene. When people were given 40mg of tomato paste daily, which provides 16mg of lycopene – skin showed a definite reduction in redness triggered by the sun’s UV rays. Carrots-Contain orange pigment beta carotene, which scientists believe can help to protect against sun damage. The supernutrient is also found in mangoes, sweet potatoes and pumpkins. Wild salmon- All wild oily fishes such as salmon, mackerel, sardines and anchovies give us omega-3 oils. These essential fats may be especially helpful for anyone who suffers from dry, red and itchy skin due to conditions such as psoriasis. Fish is also a great source of collagen-producing protein. Prawns- These give us copper, needed to make melanin – the natural dark pigment that helps to protect us against sun damage. It is also needed for collagen and for elastin which allows our skin to stretch and ping back into place without leaving any lines. 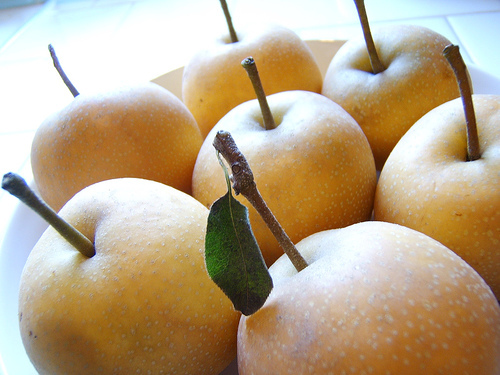 Fuji pears — or Asian pears – were used by Chinese courtesans to get rid of dark circles under the eyes,” says Dr. Mao. Fuji pears are chock full of vitamin C and copper, which can help protect the delicate skin around the eye from free radical damage. Dr. Mao suggests adding a tablespoon of honey to a peeled, cored pear and then steaming for 15 minutes. Not only is it a delicious dessert, but the copper in the pear contains superoxide dismutase (SOD), an enzyme that helps mop up free radicals that enter the body via air pollution, says Dr. Mao. Garlic. Allium is an antioxidant that packs a punch. Garlic, onions, and scallions are loaded with this free-radical fighter that is good for your skin and your immune system. Black garlic helps to repair age-damaged skin. Uniquely colored due to its fermentation process, black garlic contains double the antioxidants as regular garlic and can be eaten raw. It strengthens and restores skin cells damaged by the aging process. Use it in place of regular garlic in most recipes. Sunflower Seed Butter works to unclog your arteries. It’s rich in polyunsaturated fatty acids including one that lowers your cholesterol. Try it instead of peanut butter. Broccoli and broccoli sprouts. Quercetin is another powerful antioxidant that is found in broccoli, along with other foods including cranberries, onions, and apples. It is a natural anti-inflammatory agent as well, fighting the No. 2 cause of aging. Broccoli sprouts have 30 times more isothiocyanates (yet another antioxidant) than regular broccoli. Shakeology– The convenience of a meal replacement shake cannot be beat! I am much less concerned about getting my servings of veggies in since Shakeology packs such a whallop of potent super-foods, anti-oxidants and essential nutrients. Even eating the recommended serving of fruits and vegetables every day won’t give you this much nutrition. In a 90 day study participants who replaced one meal a day with Shakeology reduced oxidative stress, a risk factor for degenerative diseases, by as much as 90%. 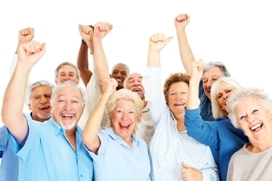 Oxidative stress is also what makes you look and feel old. Click on the link above to read more about this all natural, ultra premium nutritional shake. -Exercise can make you look younger! Turns out that exercise can get deep in your body, even into your DNA. Researchers have found that people who exercise have younger DNA–by up to 9 years. That is an incredible benefit. So exercising may do more than help prevent illness, it may actually make you younger. Thanks to modern research we now know one of the best ways to look younger is through exercise and that strenuous workouts are one of the most effective strategies. That doesn’t mean you have to be super-fit to reap the benefits. It just means you need to find your fitness level and exert yourself accordingly. So, for example, complete beginners can go from walking to power-walking and intermediates from power-walking to walk/run intervals. Always check with your doctor before starting any exercise program. To gauge the intensity of your workout, you can use the Talk Test. This is a scale of one to ten for describing how hard you’re working – one being extremely easy and ten extremely hard. If you’re doing a moderate workout, this would translate to a level five on the scale – at this point you should be able to easily hold a conversation as you exercise. If you’re breathing hard and it’s harder to hold a conversation, you’re working out at a harder pace of around level eight to nine. This is the level you are aiming for to achieve strenuous exercise. DO THIS: Three times a week, using the cardio of your choice – such as walking, running or cycling – complete the following workout: After a five to ten-minute warm-up, speed up until you are at around level eight to nine on the Talk Test and hold that for 30 seconds. Recover at an easy pace for one minute. Repeat for a total of five to eight intervals. Telomeres, the biological clocks of cells, get shorter as people age, yet research on 50-year-old marathon runners, recently published in the journal Circulation, showed that the middle-aged runners had telomeres that were as long as 20-year-olds. And in a long-term study involving 913 pairs of twins, Danish scientists found the twins who looked younger than their true age had longer telomeres. DO THIS: Using your cardio choice (try running, walking, swimming, skipping or cycling), warm up for eight minutes. Speed up to a comfortably hard pace (around level seven to eight on the Talk Test) and hold for ten to 15 minutes. Recover at an easy pace for five minutes. Repeat once or twice. Do this four times a week. Researchers at Tel Aviv University’s Sackler School Of Medicine looked at how exercise affects ageing in muscles and bones. The results, published in the scientific journal PLoS ONE, demonstrated that endurance exercise unlocks the stem cells in muscles, helping to prevent muscle deterioration and make you look younger. DO THIS: Five days a week, do 30 to 45 minutes of easy to moderate-intensity cardio (use the cross trainer, hike, bike or swim – anything that keeps you going for at least 30 minutes). Mix up your routine – swim one day, run the next – to train different muscles and beat boredom. Strenuous exercise makes your heart work harder, pumping more blood throughout your body to all of its various arteries, veins and capillaries, including those just underneath the skin. Clare Muir, head of training and education at the International Institute For Anti-Ageing, says this increase in your body’s circulation can improve the look of skin, as well as boosting detoxification and skin cell renewal. DO THIS: Circuit-training every other day. This is an exercise technique that utilizes a series of moves in swift succession, with no rest in between. For example: Push-ups into squats, followed by jumping jacks. This allows your workouts to strengthen while burning fat at the same time. The best way to engage in strenuous exercise is under the watchful eye of a professional trainer. A trainer can design and modify your workouts to suit your needs and limitations. The first thing people always say is” I can’t afford a trainer”. So the question is….. can you afford to be sick? Would you rather spend your money on prescriptions with side effects? Is it cheaper and easier to have a stroke? Spend time in the hospital?